Credit TaliskerWhiskyAtlanticChallenge.com. Women in the Talisker Whisky Atlantic Challenge cross the Atlantic between Spain and Antigua in 2017. How Long Does It Take to Row Across the Atlantic? A new year is around the corner, marking a time to set new challenges, and embark upon new adventures to push yourself. We’re excited about lots of challenges here at Rowing The World—including new initiatives and new rowing trips. This is the kind of stuff that makes us innovative, and changes us, in big and small ways. What is challenging to one rower may not be challenging to the next. For some, training for and joining us on one of our rowing trips can be a challenge and an opportunity to become able to row longer than usual distances for multiple days. For others, our trips are a row in the park – sometimes literally. 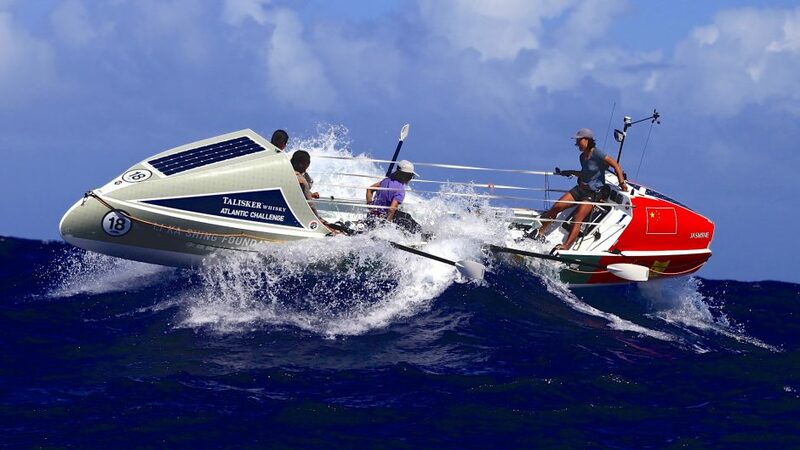 For many, ocean rowing can be a challenge, while for others, endurance is the thing. Combine the two? 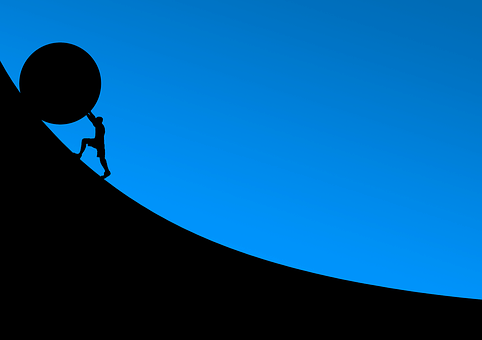 You get the idea – there is always a bigger challenge. Colin Angus rowed around Vancouver Island. Daryl Farmer took 96 days to cross the Atlantic solo. We love to see what new challenges friends like Guin Batten come up with next. She holds the record for crossing the English Channel in a single and has set records rowing the North Atlantic. Credit TaliskerWhiskyAtlanticChallenge.com. 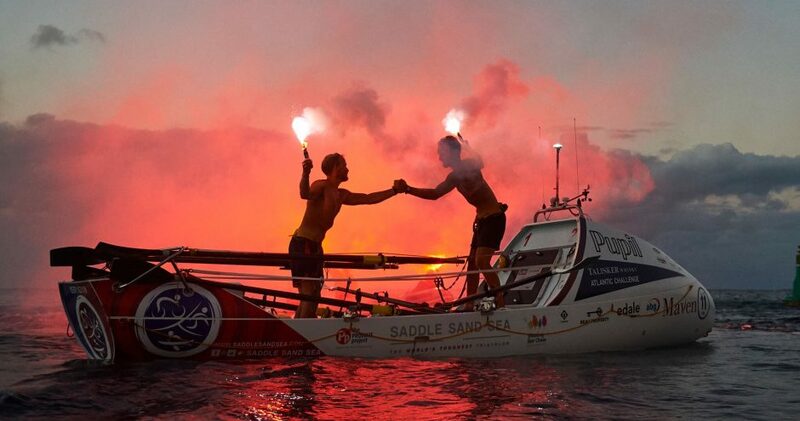 Two men celebrate at the completion of the Talisker Whisky Atlantic Challenge crossing the Atlantic between Spain and Antigua in 2017. The Talisker Whisky Atlantic Challenge is called the world’s toughest row, in a race that goes more than 3000 miles west from San Sebastian in La Gomera, Canary Islands, Spain to Nelson’s Dockyard, English Harbour, Antigua & Barbuda. Up to 30 teams participate from around the world, and start off with an electric atmosphere as people help each other prepare for the challenge of crossing the Atlantic Ocean in a rowing boat. Each rower loses on average 12kg crossing the Atlantic. In the 2016 race, solo rower Daryl Farmer arrived in Antigua after 96 days, rowing without a rudder to steer with for nearly 1200 miles in 40 days. But, a quick look at the 2017 Leaderboard reveals other amazing stats for the fastest team to row across the Atlantic, the first sisters to row any ocean together, the youngest person to row any ocean and the first Type 1 Diabetic to row across the Atlantic. 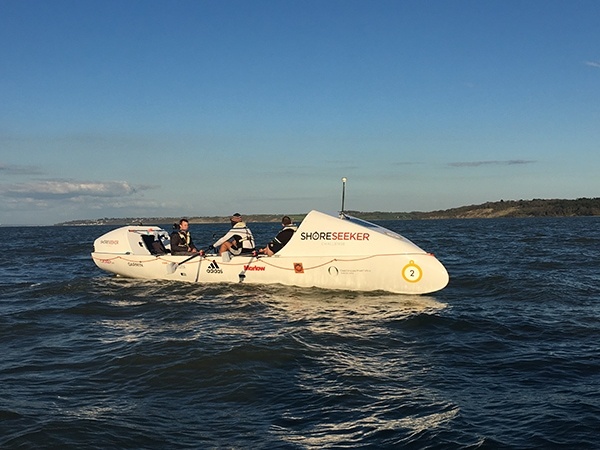 Shoreseeker is an open water adventure rowing company designed to bring the incredible experience of ocean rowing to a wider audience, no prior experience required. For a challenge of a shorter duration, Shoreseeker is an open water adventure rowing company designed to bring the experience of ocean rowing to a wider audience. They will train you, equip you and team you up with like-minded adventurers. After training, rowers choose from a series of week-long challenges. The experience is depicted here in a fun UK Adventure Rowing Race Series infographic. Undoubtedly, the Prague to Hamburg Rowing Race, an 850-km row for 12 straight days between Prague and Hamburg, is a challenge of the epic sort. 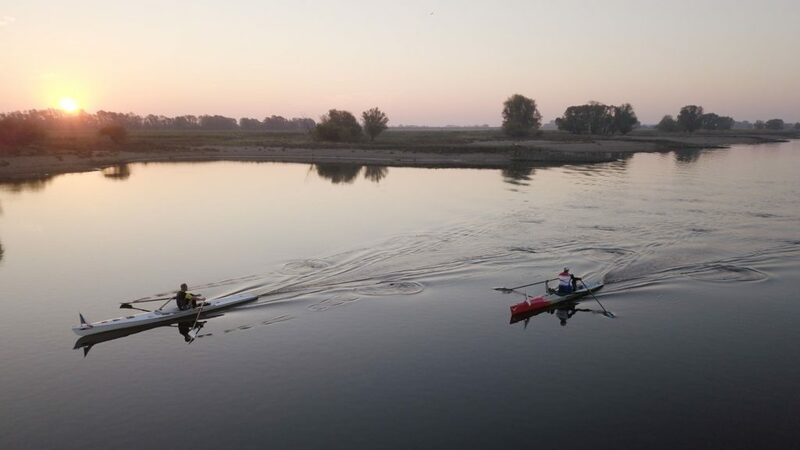 Completed in October, 2018, the scullers had challenges within the challenge, such as powerful currents or trying to grab a few winks with high winds on the river. Read more about it in this article Extreme Row Across Europe on the World Rowing site. But we understand if you choose to admire these challenges from Afar. 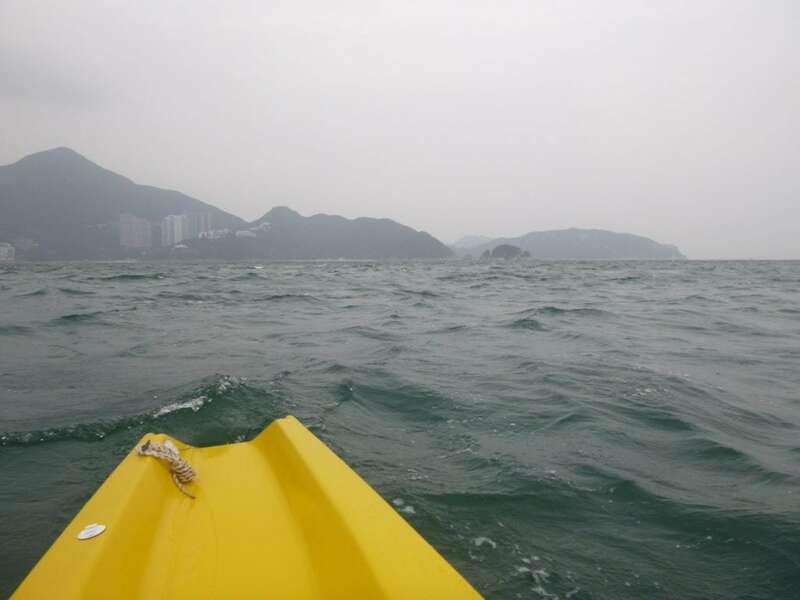 There are fewer worries with waves while coastal rowing, here with a view from the stroke seat in Hong Kong on the South China Sea. For those of you who row still rivers and placid lakes, going coastal may be a challenge you’d like to try, especially because it’s a sport that is growing rapidly. What exactly is coastal rowing? Apparently, everything but the movement of the stroke is different. Coastal rowing is the mountain biking of rowing. It’s wilder, and typically over different terrain, and there may be more surprises. Simply put, you need to relax but constantly adapt to wind, waves and current. Have a soft catch and apply power mid-stroke. Row more upright. Ensure a clean release. When rough, get about 20 cm of horizontal hand separation. Keep rowing or you’re really in trouble. Does that sound fun? Challenging? Monster the Loch is a new event, and the first mass participation boat race on perhaps the world’s most famous lake, Loch Ness. All human powered boat types are invited to race The Loch, which is 22.7 miles long. On September 28, 2019, 100 boats will be spread across the entire Loch at the start line. Organizers are hoping for the right conditions to see some world records broken. The current rowing record is 2:28.09. In Australia, the Flying Doctor Rowathon, on the Murray River, is not a race but is a major draw. Watch the site for next year’s row, an annual one-day marathon row held at Wentworth, New South Wales. The row raises funds for the Royal Flying Doctor Service, that has been saving lives and assisting people in the outback and remote communities for 90 years. The 2018 course of 90 kilometres—in recognition of 90 years—will be rowed on the Darling and Murray rivers. Rowers can complete the full distance or row one of four equal stages. At least one of Rowing The World’s new trips in Australia will be on a stretch of the Murray River but we will definitely not row 90 kilometres in one day. Whether rowing across an ocean, a lake, or the river through town, choosing a challenge is also a challenge, nor is it always the right thing to do. Whether rowing across an ocean, a lake, or the river through town, choosing a challenge is also a challenge. Choose wisely, have fun and good luck! You’ll change yourself and perhaps the world in the process. Nice to hear from you. Unfortunately we do not have any trips in the Christmas or Easter time periods. For August, we are working on a trip in St. Petersburg Russia. Hopefully we will have that finalized in the next few weeks.